It is the fourth commandment found in Exodus 20:8, “Remember the Sabbath day to keep it holy.” So how are we doing when it comes to keeping the Sabbath holy? For Donald Mossa’s church, it is a weekly ordeal. The moment the youth choir sings its last note, a pack of parents rush their kids to soccer games. For others, they simply skip Sunday services because of a sports tournament. Mossa has had enough of Sunday morning sports. He is part of the Hanover Township Interreligious Council, a group of pastors from eight Hanover, N.J. churches. Together, they represent most of the churches in town and five denominations, which serve more than 5,000 church members altogether. The pastors approached the township committee last month and asked officials for help in restoring sacredness to the Sabbath by banning sports games on Sunday mornings. In response, the township committee has asked the pastors to meet with local sports leagues to discuss the ban. Despite their efforts, not all churches are onboard with the idea. Some churches in the area have tried to accommodate busy Sunday schedules by adding weekday and summer services for families. Kwoh’s story acknowledges that the conflict between religion and sports is a long-fought battle that gained the spotlight in the late 1990s when Pope John Paul II urged Catholics to “swim upstream” and keep their Sundays “sanctified” from other activities. New York’s former Archbishop, Cardinal John O’Connor, has also criticized Little League Baseball and children’s soccer leagues for scheduling Sunday morning games. Where are Southern Baptists on this issue? According to the Baptist Faith and Message 2000, the first day of the week is the Lord’s Day. It is a Christian institution for regular observance. It commemorates the resurrection of Christ from the dead, and should include exercises of worship and spiritual devotion, both public and private. Activities on the Lord’s Day should be commensurate with the Christian’s conscience under the Lordship of Jesus Christ. What might happen if 1,750 Oklahoma Southern Baptist churches joined together and asked local sports leagues to give it a rest on Sundays? Would our churches agree on the issue? Would other churches join the effort? Would parents support the idea? How about you? What is your opinion? Should Sundays be reserved for worship and spiritual devotion, both public and private? Does participating in little league sports qualify as a Sabbath Day activity? Is Sunday the only day to observe the Sabbath? Exodus 20:9-10 says, “Six days you shall labor and do all your work, but the seventh day is a Sabbath to the LORD your God. On it you shall not do any work, neither you, nor your son or daughter, nor your manservant or maidservant, nor your animals, nor the alien within your gates.” How does this Scripture apply to today’s culture? What does your conscience say about your activities on the Lord’s Day? Are they under the Lordship of Jesus Christ? We would love to hear from you regarding the Sabbath. 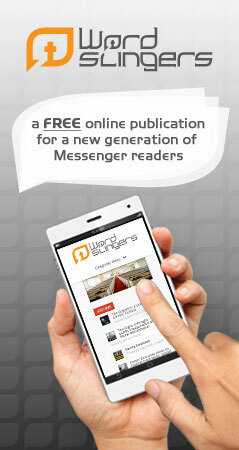 Log onto www.BaptistMessenger.com and click on the link located in the Reader Feedback section of our Web site. You may also send your comments by mail to: Baptist Messenger, 3800 N. May Ave., Oklahoma City 73112. Be sure to think twice before you send it on the Sabbath!